New Orleans City Park cut the ribbon on a 100-foot pedestrian bridge that was installed between the Volunteer Center and Couturie Forest creating a new entrance to the forest. Near the new bridge, a fence was installed and new gravel parking lot was established. Couturie Forest is open to the public from 7 am to 8 pm (during daylight savings time). The public should make sure to remove their vehicles from the parking lot by closing time, as gates will be locked. The bridge arrived on semi-trailers in two 50-foot sections. It was off-loaded by a large crane and then bolted together to form one 100-foot long bridge. The crane then hoisted the bridge over the lagoon and the ends were secured to the previously installed footings. Couturie Forest is the perfect place to escape from the city without ever leaving town! Combined with Scout Island, the 60-acre site is a nature-lover’s haven filled with native trees, scenic waterways, and fascinating wildlife — all in the heart of the New Orleans. The forest is a great place to wander with your kids, family, and friends. An afternoon along the trails is more than just exciting – it’s an easy way to work in some exercise and learn a thing or two about the park’s rich, natural landscape. 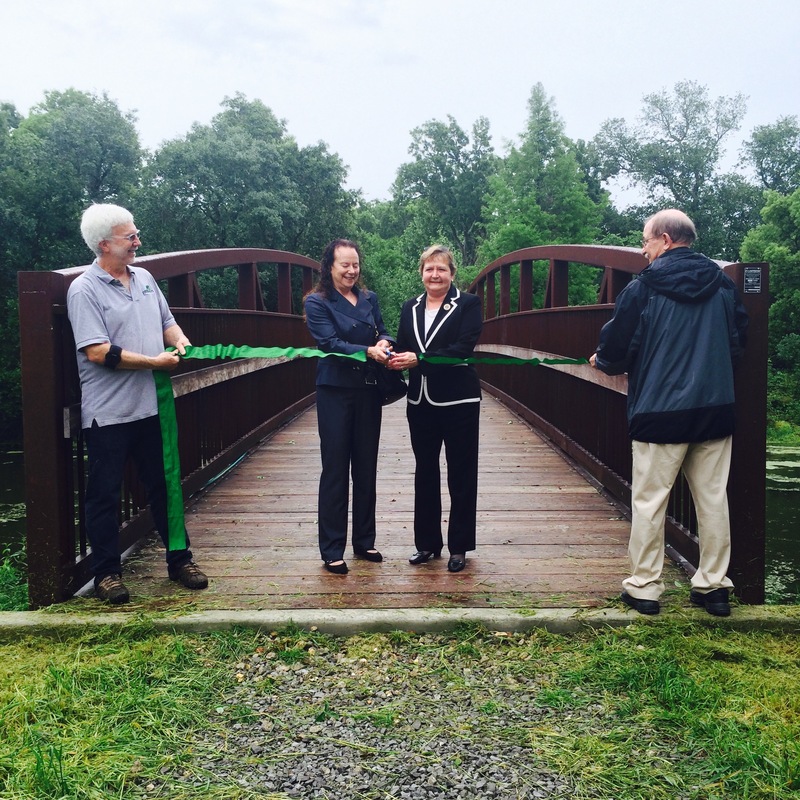 The Couturie Forest Pedestrian Bridge was paid for by the Federal Highway Administration’s Recreational Trails Program through the Louisiana Office of State Parks. Matching funds for this grant were provided by New Orleans City Park and Friends of City Park. In all, this project totaled $270,627.00. This pedestrian bridge will provide the new entrance to Couturie Forest. Other upcoming improvements to the area include bike parking and a bike repair station and pump that will also be sponsored by the Federal Highway Administration’s Recreational Trails Program. Additionally, the temporary gravel parking lot will be upgraded in coming years to a fully paved parking lot with 18 spaces, a water fountain, and an informational kiosk through the Louisiana Department of Transportation and Development’s Transportation Alternatives Program. These improvements will constitute the Harrison Avenue Trailhead, which will be a hub for alternative transportation routes throughout the Park. This trailhead will connect Couturie Forest’s rugged trails with the Harrison Avenue bike lanes which connect to the bike lanes on Wisner Boulevard and the upcoming bicycle and multi-use path on Marconi that is a Louisiana Department of Transportation and Development’s Transportation Enhancement Project. It’s Earth Day at City Park! Earth Day at the New Orleans Botanical Garden promises to be a great event! The event will bring live music, educational lectures, and of course delicious food, to City Park. -Guidance on living a sustainable way of life: 25 local businesses and non-profit organizations that contribute to a greener way of life will have booths and will welcome questions. Whether it is growing food, food preservation, solar energy, natural products, composting, or permaculture, Earth Day will have booths selling their wares or providing advice on living green in New Orleans. -Kids can use recycled materials to make an art project or kids can test their recycling knowledge with the “Sort the Trash” game. Kids can listen to Grant Estrade from Laughing Buddha who will teach about the importance of worms in the soil or complete a scavenger hunt around the Botanical Garden. - Enjoy the spring opening of the “Good eARTh Experience art show” in the Shade Garden featuring several local artists. To accompany the art, there will be live music by The Necessary Gentlemen. -Art Demo: Linda Berman, a ceramic sculptor, will be giving a clay hand-building demo during the art show. Learn about how young New Orleanians are becoming leaders through sustainable agriculture in City Park. Grow Dat will lecture on the experience as an organization, farm business, and how ecological farming contributes to a more just food system. Water Wise NOLA is comprised of Global Green USA, Dana Brown & Associates, Water Works, Hilairie Schackai, Neighborhood Partnership Network, and the Louisiana Urban Storm Water Coalition. Their goal is to educate local residents about local water issues and how to address water as individuals. All programs will have a Questions and Answer Session which will help classes count for CEU’s for teachers, landscape architects, architects, and LA Master Naturalists. Enter on Victory Drive or on Stadium Drive. There is free parking available on Park streets and in the parking lot across from the entrance to the Botanical Garden. We encourage you to ride your bike. We’ll have special bike parking on Victory Drive. This is a reblog. The original article can be found by clicking here. Getting up for a sunrise walk can help you lose weight — but it isn't just the walking that makes the difference. Earlier this year, researchers at Northwestern University revealed that exposure to morning light can help as well. Light exposure probably plays a role in regulating metabolism, much in the same way that the level of light exposure can cue wakefulness or sleepiness. Animal studies performed on mice have shown a similar correlation between light exposure and BMI, so the findings were not terribly surprising... Though the study confirms a correlation between early morning light exposure and body weight, researchers have not yet confirmed a causal connection. So there's not yet any reason to think that simply turning the lights on in the morning will trim the pounds. Because our bodies are attuned to the sun — that is, after all, how we get our vitamin D as well as the melatonin that plays a role in our circadian wake-sleep cycles — there is probably a link between getting out into the early morning sunlight. More research is needed, but in the mean time, it couldn't hurt to get up for a sunrise jaunt. You may just get to witness beautiful scenes like this one. Thanks Tulane University! We LOVE our volunteers! New Orleans City Park is grateful to the staff of Tulane University for once again volunteering in the Park. This annual day of service with Tulane University staff will include 180 volunteers. Volunteers will be removing invasive tree species on Scout Island and working to improve trails on Scout Island. Scout Island is the perfect place to escape from the city without ever leaving town. Combined with Couturie Forest, the 60-acres are a nature-lover’s haven filled with native trees, scenic waterways, and fascinating wildlife — all in the heart of the New Orleans.Volunteers will also be working on the Grow Dat Youth Farm clearing brush and doing general farm maintenance. The Mission of the Grow Dat Youth Farm is to nurture a diverse group of young leaders through the meaningful work of growing food. On the farm, staff and volunteers work collaboratively to produce healthy food for local residents and to inspire youth and adults to create personal, social, and environmental change in their own communities. NOTE: Anyone is welcome to volunteer in City Park. If you are interested, please email Earl at Esires@nocp.org.